2013 was a decidedly positive year for North American equity markets. The S&P 500 Total Return Index was up a blistering 32.4% while the S&P/TSX Total Return Index was up a respectable 13.0%. During the fourth quarter, the Canadian market returned 7.3% compared with 10.5% in the United States. 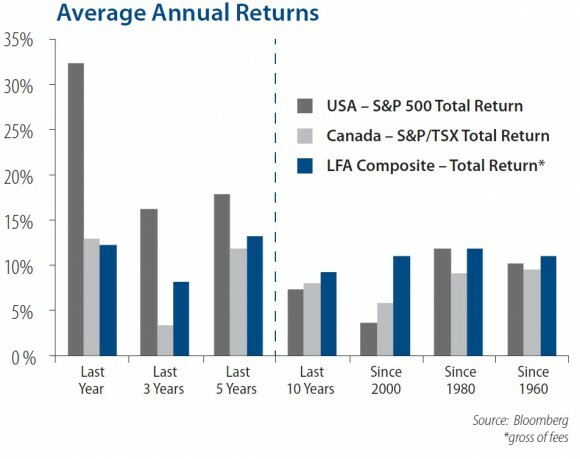 The Financials sector now accounts for over 35% of the Canadian market and was the biggest positive contributor on the TSX, up nearly 24% during 2013. The Materials sector was the largest negative contributor on the TSX for the third year in a row, down 29%. Gold stocks, which are included in the Materials sector, were down 44% on the year. Dividend growth was strong in client portfolios, with 74% of our core holdings increasing their dividends in 2013. This is the highest percentage on record since we started tracking these statistics in 2008. The portfolio weighted average dividend increase was slightly muted relative to 2011 and 2012 due to a surprise dividend cut from Encana at the end of the year. Since 2008, the weighted average dividend increase for our core hold¬ings is just under 7% per year. We believe that growth in the total value of the portfolio is directly related to the rate of dividend increases and that is why we are comfortable with a 6%-9% annual total return expectation for equity portfolios. Remember that dividend stocks also include the added ben¬efit of being significantly less volatile, with increased downside protection. As we look ahead to 2014, we expect another solid year for the Canadian equity market, but are more cautious on the US market given the rapid price appreciation during the last two years. We believe the US economy is poised to accelerate as the private sector is finally strong enough to withstand stimulus withdrawal and post 3%+ GDP growth. Canada is expected to grow more slowly. We are maintaining our 1-3% growth path for the Canadian economy as export strength from a softer Canadian dollar will be tempered by a cooling housing market and stimulus withdrawal. Our view for the North American equity markets is the reverse of our economic view. Stock markets are a leading economic indicator. Although we believe economic growth in the US will outpace Canada, a lot of good economic news is already priced into the US market. Meanwhile, the Canadian market has a dividend yield that is a full 1% higher than the US market, and two of its three largest weighted sectors (Materials and Energy) posted decidedly negative returns for 3 straight years. These factors give us a healthy amount of optimism about Canadian market performance going forward in 2014 and beyond, despite a somewhat tepid economic backdrop.